Shinzo Abe is likely to win comfortably this weekend. But what will it mean? This Sunday, parliamentary elections in Japan are widely expected to return Prime Minister Abe and his ruling coalition to power. Japanese media polling data point to a victory for the Liberal Democratic Party (LDP) of over 300 of the 475 Lower House seats, and with an additional 30 or more seats expected for the Komeito, the LDP’s junior coalition partner, this would give the current government a comfortable basis from which to govern. It is even possible that Mr. Abe’s government will retain its two-thirds majority, allowing his next government broad legislative support for his policy agenda. But less certain is what the prime minister’s mandate will be. Part of the answer lies in how this referendum is framed. Mr. Abe himself dubbed this snap election the “Abenomics kaisan” in an effort to garner popular endorsement for his economic policy agenda. Japan’s prime ministers have regularly dissolved the Diet and called for a snap election, and the most memorable of these moments of electoral throw down are always named. Perhaps one of the most famous was the “bakayarou kaisan” (the “go to hell” snap election), called after Prime Minister Shigeru Yoshida told off a rival on the floor of the parliament in March 1953. In 2005, Prime Minister Junichiro Koizumi dubbed his snap election the “yuusei kaisan” (postal savings snap election), an appeal to the Japanese public for support against many in his own party who opposed deregulating Japan’s postal savings program. Koizumi won a landslide victory, and removed recalcitrant legislators from the party for opposing his vision of structural reform. Perhaps this precedent deters anyone today in the LDP from openly criticizing Mr. Abe’s snap election, although early on, there was quite a bit of grumbling about its timing. On Sunday, it will be how Japan’s voters define this election that will matter the most. And from the campaign polling data, the message is decidedly mixed. Immediately after the dissolution of the parliament, public opinion polls suggested little public interest in having yet another election. The NHK poll reported only 23 percent of their respondents said they were “very interested” in the election, 19 percent less than the election that returned Mr. Abe to power in December 2012. The LDP garnered higher support: theNikkei Shimbun reported 35 percent and the Yomiuri Shimbun reported 41 percent of eligible voters in their polls supported the LDP. The Democratic Party of Japan (DPJ) got the highest support among the opposition parties (9 percent in the Nikkei poll and 14 percent in the Yomiuri poll), but clearly they trailed far behind the LDP. But the most interesting initial result was that most Japanese were undecided about who to vote for: 45 percent in the Nikkei poll and a whopping 60 percent in the Yomiuri poll had not chosen a party. First, and most obvious, will be how many Japanese turn up at the polls. The voter turnout at the last Lower House election was a postwar low, with only 59.3 percent showing up at the polls to return the LDP to power. Three years earlier when Japanese voters gave an opposition party, the DPJ, a chance to rule Japan, the voter turnout was significantly higher at 69.2 percent. The highest voter turnout recorded in postwar Japan was 76.9 percent in 1958 when Prime Minister Abe’s grandfather, Nobusuke Kishi called a snap election. (His was called the “hanashiai kaisan” or the “let’s talk about it” election.) Unlike the last two Lower House elections, this election does not offer the option of a change in government. The opposition is not strong enough to draw voters away, and they seem unable to build their own coalition to challenge the current ruling LDP-Komeito coalition. With no real alternatives, many voters are expected to simply stay home. In 2012, the drop in voter turnout below the 60 percent threshold was widely noted by political commentators as a red flag for the LDP’s mandate. Today, it is hard to think of what a new threshold might look like. All are expecting turnout to be lower, but the question is how much lower? Will it slip to 50 percent? Or to the 40 percentile? While it will likely end up being the lowest in postwar Japanese political history, it might be useful to compare it with other parliamentary democracies. Canada, France, Korea and the UK have all had elections where voter turnout slipped below the 60 percent mark (Korea and France twice over the past four elections). But Germany and Israel draw far greater turnout numbers (in the 70 percentile for Germany and 60 percentile for Israel). In the United States, congressional elections that do not coincide with a presidential election have a voter turnout in the 40 percentile. While the electoral systems of these democracies differ, they all have vibrant and multiple parties contending for power. This Sunday’s election is likely to raise some important discussions in Tokyo about why Japan’s voters are not enthusiastic about their political choices. Second, what will this election mean for Japan’s opposition parties? Perhaps the most troubling aspect of this election is how weak Japan’s political opposition has become. Since the parliament was dissolved, the opposition parties have demonstrated little capacity for developing alliances on policy platforms to challenge the ruling coalition. Individually, they are weak, and they remain divided, unable to form a unified front. The DPJ suffered badly in both the Lower House election of 2012 and the Upper House election the following year. The largest of Japan’s opposition parties, the DPJ had only 62 seats in the Lower House going into the campaign. DPJ leader, Banri Kaieda bravely called for raising that to 100 seats on Sunday’s vote, but polls show that the DPJ is poised to do only marginally better. Reporting in some districts suggests that even opposition incumbents may suffer at the hands of voters who are discontented with both the DPJ as well as the LDP. None of the other parties can compete for power, and so Mr. Abe’s calculation that the LDP could take advantage of opposition weakness may really pay off. Few parties are able to run a candidate in every one of the 295 single member seat districts; but the LDP is well positioned. The only opposition party who had candidates available to run in these single member districts across the country was the Japan Communist Party (JCP), and they are expected to pick up seats on Sunday. However, the JCP only had 8 seats going into the campaign. A better measure of how voters register their displeasure could come from the outcome of the 180 proportional districts. It is here that those floating voters, those who are undecided, are likely to express their disaffection. In an effort to capture this aspect of Sunday’s election, the Yomiuri Shimbun conducted a detailed poll of 70 of the 295 single member districts. When asked how they would vote in the proportional representation portion of their ballots, 41 percent gave no answer. Those who did have a party preference were evenly distributed: 15 percent for the DPJ, 14 percent for the LDP and 13 percent for the JCP. In the waning hours of the campaign, expect the leading political parties to be working hard to sway the undecided voter. Finally, the election on Sunday will offer some insights into what the Japanese voter thinks about the policy choices facing Japan. Ironically, polling thus far reveals that Japanese are underwhelmed by the results of Abenomics, despite the prime minister’s call for a referendum on his economic policy management. Anywhere from 50-70 percent of those polled by Japanese media register disappointment in the economy. Moreover, the Abe Cabinet’s disapproval rating (42 percent according to Nikkei’s December 12 poll) now matches his approval rating, suggesting that the campaign has not changed the public’s views on the prime minister’s agenda. As expected, most Japanese listed health care, social security and child care as being their highest policy priorities. Security and foreign policy issues were not high on the list of popular priorities. Some of the smaller parties have national defense policies associated with the Abe Cabinet at the forefront of their campaign, but both pro and con positions are represented. The conservative Next Generation Party is running for a strong national defense, particularly supportive of a strong stance against those who challenge Japan’s territorial sovereignty, and the Japan Socialist Party is running against reinterpreting the Japanese Constitution to allow for collective self-defense. Both parties are expected to lose seats in the election. There is some attention being paid to individual candidates, such as former ASDF General Toshio Tamogami, a revisionist nationalist who had some success in attracting votes in the Tokyo gubernatorial election. However, there is little serious contest over Japan’s national security and foreign policy agenda. This election raised some concerns about TPP and the future of U.S.-Japan alliance cooperation, but there is little evidence that either policy issue will be set back if the prime minister’s ruling coalition wins the predicted 300 plus seats. Some more enthusiastic advocates are suggesting that the LDP-Komeito coalition could get a super majority in the Lower House on Sunday, allowing the government to override any opposition to legislation in the Upper House. How far Mr. Abe will go in pushing forward his policy priorities after the Sunday referendum will depend on how he reads his mandate. Obviously, this is an election driven by Japan’s politicians rather than by popular demand. Yet the calculated risk the prime minister took seems likely to pay off. With little to draw the voters to the opposition parties, the LDP and Komeito offer the only option for governing Japan at this moment. That the Japan Communist Party will benefit should also be noted. As a steadfast opponent of the conservatives’ vision for Japan, the JCP has had a constant place in Japan’s parliament, and today as popular sentiments on issues such as nuclear power and the consumption tax are decidedly anti-government, the JCP has also become less of an ideological choice and more of a protest voice in contemporary parliamentary politics. Voters who have no other options are turning to the JCP because they trust it can say NO to the government on issues they care about. But there will be other issues where a strong and vocal array of Japanese voices will be needed: ensuring full attention is paid to the needs of the dwindling number of younger Japanese who are expected to support their nation’s economy, ensuring a full and representative deliberation over Japan’s future relations with its neighbors in South Korea and China, and ensuring that the nation has a full debate over its own future direction and identity. All will require steady leadership from across the political spectrum. Sunday’s election will reveal the current complexion of sentiment among the Japanese electorate. Japanese citizens, like those in most other advanced industrial economies, are worried about their ability to take care of their families. Whether they will show up at the polls to register their views on Mr. Abe’s agenda remains to be seen. 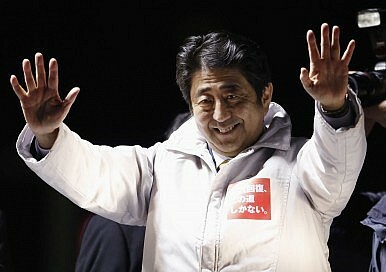 After his Lower House victory in 2012, the prime minister was restrained in his celebration, noting the need to win over more of the Japanese public. This 2014 election will extend his time in office, but it may offer an even more ambiguous mandate, even as it returns his ruling coalition to power.